My Martha’s Vineyard | From the Seasonally Occupied Territories . . . This is one of my earliest posts to this blog, and one I think about often. I live in a town with fewer than 3,000 residents and on an island with an estimated 15,000 year-round residents. I’ve lived here nearly 30 years and I have a hard time making generalizations about either this town or this island. Yet some people apparently have no trouble making generalizations about Muslims, a group that includes hundreds of millions of people and about which they know much, much less than I know about West Tisbury or Martha’s Vineyard. What’s going on here? 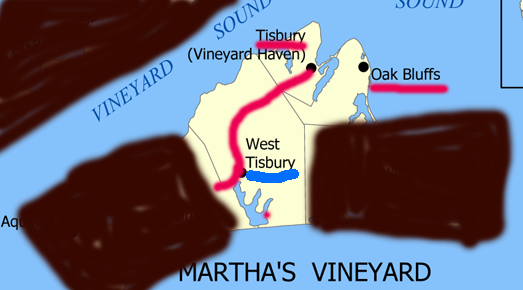 Which Martha’s Vineyard do you live on? All the road maps and atlases agree that there’s just one Martha’s Vineyard, but none of us live on those maps. I’m talking about the map that lives in each of our heads. Call it our psychic map. No two psychic maps are exactly the same, though you’ll almost certainly find the Steamship Authority dock in Vineyard Haven on just about everyone’s map, be they day-tripper, summer visitor, recent arrival, longtime year-rounder, or island native. This entry was posted in Martha's Vineyard, musing, public life and tagged community, politics, psychic map, risk, terrorism. Bookmark the permalink. The same applies to every town and even every state, I think. A state like CA for exemple is seen totally differently depending on where you live. Many who stay their entire life in the same part of the state, the same town and even the same neighborhood have false or distorted opinions on the rest of the state, only because they have never been. As always it’s interesting to see how such a small island can be in fact perceived so differently, between year-round residents or summer residents and also simply because of your home location and interests. And you could probably write the same for any country as well, where most residents see only what’s going on, right around them. I think you’re right! 🙂 My theory is that knowing one place well teaches me a lot about the world, and that knowing something about the world teaches me a lot about my particular place. Before Martha’s Vineyard I lived for a long time in Washington, D.C. — but not in the Washington, D.C., that appears in the national and international media. So often we see what we want to see or expect to see. I’m fascinated by this, and by the “tourist industry” in general. I would have a very hard time being a tourist. I couldn’t stop thinking about what I wasn’t seeing and about what the people I talked with weren’t saying.